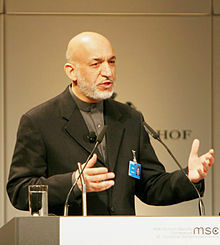 Hamid Karzai (Pashto: حامد کرزی - Ḥāmid Karzay; bíi Ọjó kẹrìnlélógú Oṣù kejìlá Ọdún 1957) jẹ́ Ààrẹ orílè-èdè Afghanistan fún bí ọdún mẹwá, lati Ọjọ́ keje Oṣù kẹjìlá Ọdún 2004 di Ọjọ́kàndínlọ́gbọ̀n Oṣù kẹsán Ọdún 2014. Dam, Bette. A Man and a Motorcycle, Ipso Facto Publ., Sept. 2014. Dam, Bette. "The Misunderstanding of Hamid Karzai", Foreign Policy, Oc.t 3, 2014. ↑ Matthew J. Morgan (2007). A Democracy is Born: An Insider's Account of the Battle Against Terrorism in Afghanistan. Praeger Security International. ISBN 978-0-275-99999-5. http://books.google.com/books?id=k35uAAAAMAAJ. Àtunṣe ojúewé yi gbẹ̀yìn wáyé ni ọjọ́ 13 Oṣù Kẹfà 2016, ni ago 17:41.